Berlin Geekettes hosted the screening of “Miss Representation”, a 2011 Sundance documentary inspiring us to the change the way our society represents women of power and influence. We encourage you to check out the movie’s website and find out how to take action. 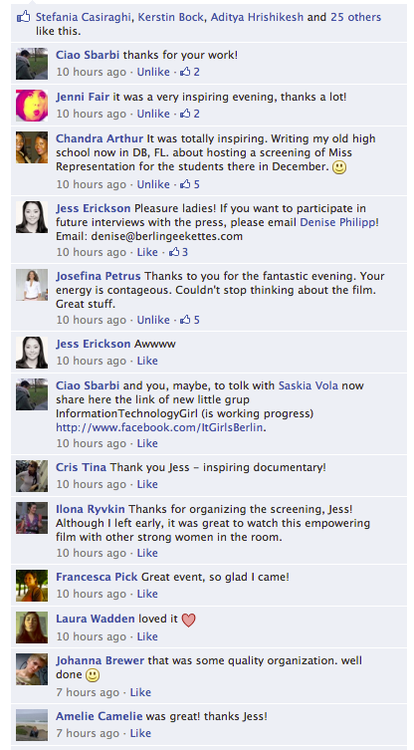 The screening was followed up with a media workshop led by Berlin Geekettes founder Jess Erickson. The workshop included a presentation on the importance of media, a mock interview (shout out to you brave, brave participants) and key takeaways to help you sail through any interview, be fearless, and deliver your message with power. We’re still receiving your amazing feedback about this event and want to thank everyone who came to inspire and be inspired! A special thanks to SponsorPay who helped us host this event. Follow @Sponsorpay on Twitter. If you want to host a workshop with the Berlin Geekettes, contact us at: denise@berlingeekettes.com. Interested in sponsoring an event? We’d like that. Contact us at jess@berlingeekettes.com.